Episode 50: eMetrics NYC Preview with Jim Sterne | Beyond Web Analytics! 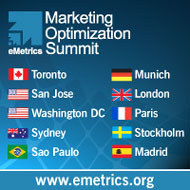 Join Adam and Rudi as they talk with Jim Sterne, the Godfather of Web Analytics, about the upcoming eMetrics Marketing Optimization Summit in New York City. The gang talks about why the conference moved to the NYC, the impact on the flood of new speakers and content, some advice for first timers to the conference, and some inside history on the birth of the lobby bar! Jim Sterne is an international speaker on electronic marketing and customer interaction. A consultant to Fortune 500 companies and entrepreneurs, Sterne focuses his twenty five years in sales and marketing on measuring the value of the Internet as a medium for creating and strengthening customer relationships. Sterne has written eight books on Internet advertising, marketing and customer service including, “Social Media Metrics: How to Measure and Optimize Your Marketing Investment.” Sterne is the producer of the international eMetrics Marketing Optimization Summits www.emetrics.org and is the co-founder and current Chairman of the Web Analytics Association www.WebAnalyticsAssociation.org Sterne was named one of the 50 most influential people in digital marketing by Revolution, the United Kingdom’s premier interactive marketing magazine and one of the top 25 Hot Speakers by the National Speakers Association. This article was posted in Podcasts, Social Media, Web Analytics and tagged eMetrics, Jim Sterne. Bookmark the permalink. Follow comments with the RSS feed for this post.Post a Comment or leave a trackback: Trackback URL.